Nerano is an ancient and renowned town on the meridional side of the “Sorrento Penisola”. It lies among the small and typical houses and walking down its street you can reach the “Cantone” beach, the perfect place to see Capri, Sorrento and the Amalfi Coast on the horizon. Near by the natural park of the Ieranto Bay. The Apartment of 80 square metres is made up of: living-room with kitchen corner and sofa-bed, 1 twin bedroom, 1 double bedroom, 1 single bedroom, 2 bathroom, 1 with hair dryer and hydromassage Jacuzzi. All with modern furniture. All the apartments are well equipped with: oven, freezer, refrigerator, stereo, TV and hydro massage Jacuzzi. 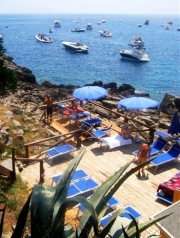 Besides there’s an swimming-pool with sun beds, garden and a wonderful panorama on the Nerano Bay. From all directions on the A3 motorway, take the exit Castellammare di Stabia and carry on ss 145. This panoramic road is 23 km long and in good traffic conditions it takes just half an hour. Napoli Centrale FS railway station (Piazza Garibaldi - Napoli Tel. 1478/88088 - free call), which is located in the city centre, is connected to the main tourist resorts. Inside the station departures of the public transports such as Circumvesuviana railway and underground. Outdside bus station departures. A very relaxing and comfortable mean of transport the private bus offers a valid alternative to public transports. They travel to the capital and to its two airports twice a day and frequently to Capodichino airport in Naples. Private buses of CLP leave from the Airport from 06h30 to 23h30 , stop at the Terminal 1 towards Piazza Municipio and Molo Beverello (the port from where the boats sail for Sorrento) on a journey of about 40 minutes. from 05h30 to 24h15 stops at Terminals 1 and 2 for the central train station at Piazza Garibaldi, there the local train of the Circumvesuviana departs for Sorrento. In one of the most beautiful area of Naples, Piazza Municipio, a few metres far from "Maschio Angioino", "Castel dell'Ovo", "Piazza Plebiscito", "Palazzo Reale", there is one of the most important departure by sea to Sorrento and to the islands of the Gulf by the quick and comfortable hydrofoils and catamarans, leaving from Beverello harbour.